Art, architecture and… hot springs. Tuscany may be world-renowned for the first two, but few outside Italy know much about the last. Yet, particularly in winter, an al-fresco soaking in mineral-rich waters is one of the best ways to enjoy this famous landscape. Most of the springs are around Monte Amiata, the hulking, dormant volcano in southern Tuscany that separates the Maremma and Siena regions and forms the backdrop to the Val d’Orcia. It hasn’t erupted for about 200,000 years; but it keeps things bubbling under the surface with hot springs gushing up around its foothills. 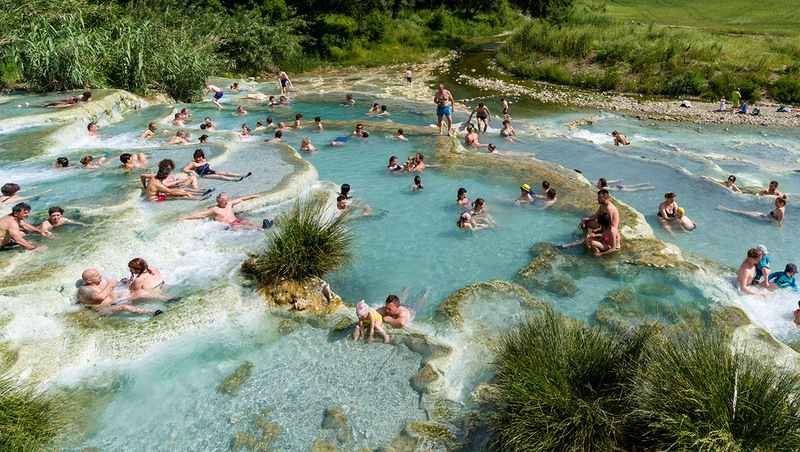 Hot springs are a way of life for Italians – they can access thermal treatments as part of the national health service. But apart from the health-giving properties, which vary from spring to spring, these thermal waters provide an incredibly relaxing way to get back to nature, and see Tuscany through a rather prune-fingered filter. Chianciano, just below the Val d’Orcia, is perhaps the best known of Tuscany’s spa towns – which is down in no small part to Federico Fellini, who set his film 8 ½ here. The hot springs were beloved by the Romans – poet Horace was dispatched here by his doctor – and before them, the Etruscans. Of course, 2,000 years of development means they’re not free anymore (although you can wander through the pine-filled Acqua Santa park and drink the liver-fortifying water from a tap at no cost). 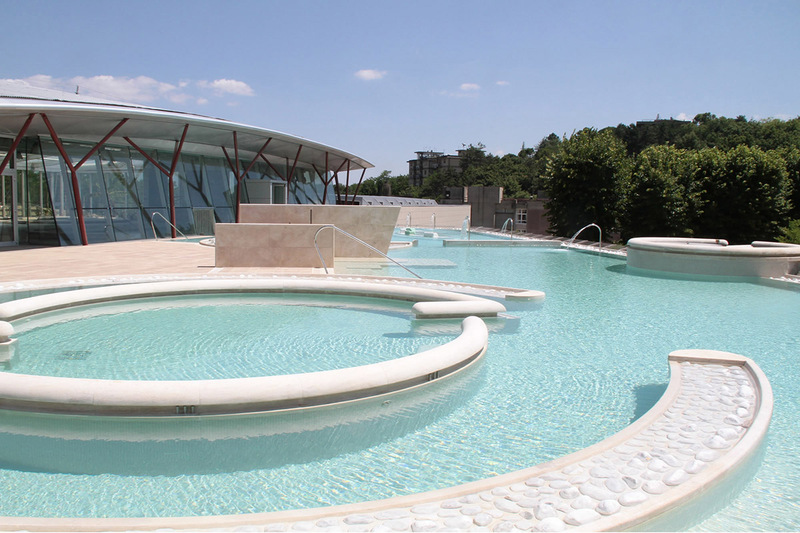 There’s still a significant medical element to the springs, but today Chianciano is a big wellness destination, with a superb spa, the Terme Sensoriali. Twenty “experiences” include chromotherapy baths, a bracing Kneipp pathway (where you walk on pebbles as you’re blasted by hot and cold water), a womblike soundproof cube, and an energy-aligning pyramid – so you can plan your own itinerary. Don’t miss slathering yourself in the mud room, or the indoor-outdoor thermal pool that’s so warm you can happily stew outside in the middle of winter. It’s a brilliant introduction to the thermal scene. From €38/£33. Deep in the wilderness, the Fosso Bianco pools, near the village of Bagni San Filippo, are perhaps the most spectacular-looking of Tuscany’s thermal springs. A five-minute, signposted walk from the village into the wooded valley brings you to what looks like an enormous static waterfall. In fact, the billowing white rock is a calcium build-up from the thermal waters that flow over it, and into the pool below. It’s high in sulphur, as well as calcium, so there’s an unmistakeable aroma. Signs advise you not to bathe (because of health-and-safety issues), but they’re ignored by all and sundry, who pile into the natural pools. For something more structured, there’s a no-nonsense hotel and spa, Terme San Filippo, with a thermal outdoor pool, overlooking the landscape, and wellness treatments using thermal water and mud. It’s open to non-residents. 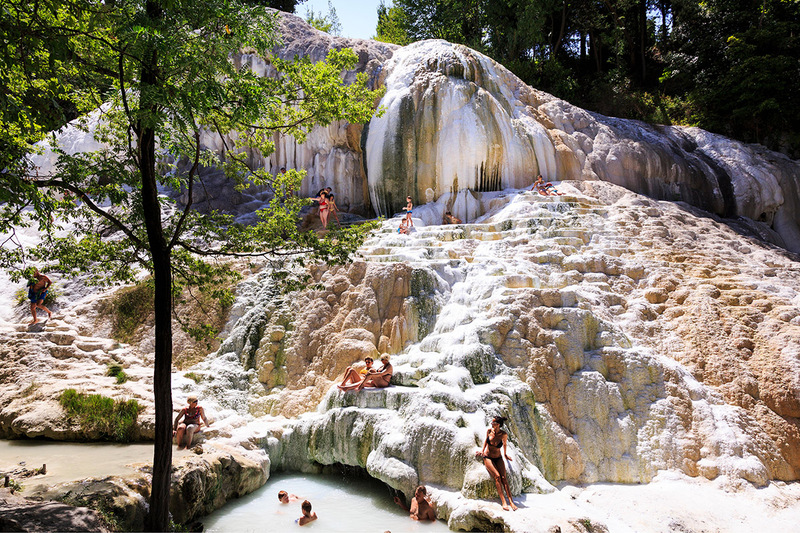 Tucked around the back of Monte Amiata in the Maremma region, Saturnia’s remote location has ensured the survival of its extraordinary volcanic crater. Here, in a natural clay-bottomed pool, water gushes out at 500 litres per second and at a steady 37°C. The crater itself, which has been ingeniously enclosed and turned into a thermal pool, is open only to guests of the Terme di Saturnia resort. But there’s also an on-site “thermal park” – one of the largest in Europe – with a series of interconnecting pools, hydromassage tubs and showers, all using the sulphurous thermal water. Entrance €23/£20.50. From the park, the water gushes downstream for a kilometre, before hitting its most famous spot, the Cascate del Mulino – a sequence of “waterfalls” where the thermal water rushes over frothy-looking calcium deposits, pooling in what appear to be natural hot tubs, before continuing downstream, to another set of waterfalls where locals are said to bathe their arthritic horses at night. It’s not only free to enjoy the Cascate, it’s easy to access, too, with a large car park. But go midweek – it’s incredibly busy at weekends. Half an hour’s drive south of Siena, en route to the Maremma, is Petriolo, where the 43°C water fills up a swimming pool-sized area beside the Farma river. Known in Roman times, Petriolo came into its own in the medieval period, when it became a pay-per-entry spa. Over the centuries, it has been popular with gentry, including the Medici family, and, later, even the Papal court. Today, it’s loved for its sauna-like experience, where you soak in Italy’s hottest thermal waters, before leaping over the calcium “wall” into the river for a bracing dip. But beware: although there’s a waterfall-like calcium build-up that looks similar to those at Saturnia and Bagni San Filippo, here the water is pumped over the minerals in plastic pipes. While it might not be as aesthetic as the others, it’s full of history – and still surrounded by the ruins of the old Renaissance spa. Montecatini Terme, near Pistoia, between Florence and Lucca, is as far in distance from the other springs as it is in style. This is an elegant spa town reminiscent of the likes of Baden-Baden and Bath, with spas set amid grand landscaped parks, and architecture dating back to the 18th century, when the Grand Duke of Tuscany developed it as a destination for health tourism. Here, the spas come straight from the Belle Époque – Terme Tettuccio is a palatial Art Nouveau complex, with the kind of baths you’d expect in Budapest, and even a reading room with grand arched walls and coffered ceiling. Terme Excelsior and Terme Tamerici are the other two grande dames. Not that they’re stuck in the past; treatments include lomi lomi massage, chakra realigning and an entire ayurvedic programme at the Excelsior. To Tuscany has a range of fantastic villas in the Siena, Grosseto and Pistoia areas. What’s on in Tuscany this spring?